A tounge-in-cheek pose of Ron Adams, Creature Kid (Paisley Adams) and Kevin Slick. 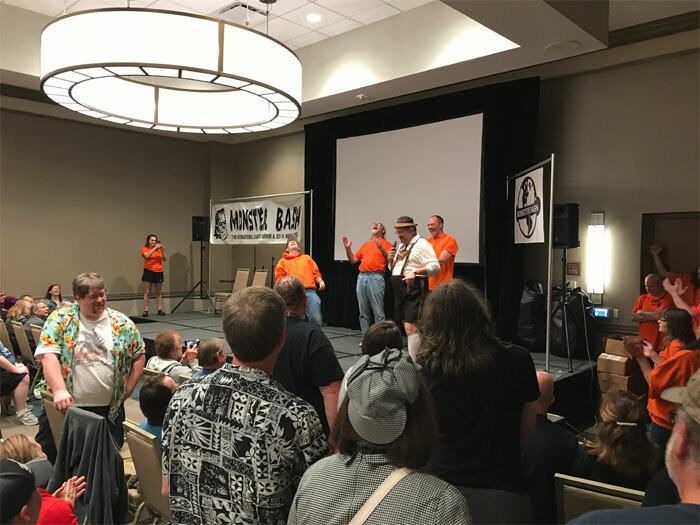 Bob Pellegrino brings the house down with cheers and laughter after he finally went full tilt wearing lederhosen to sing "The Festival of the New Wine" song from FRANKENSTEIN MEETS THE WOLF MAN! 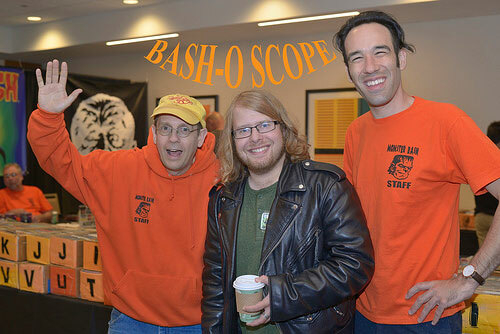 Bash producer Ron Adams, attendee (and world traveler) Dalton Smoot and Thom Shubilla (who played Criswell at Bash!). 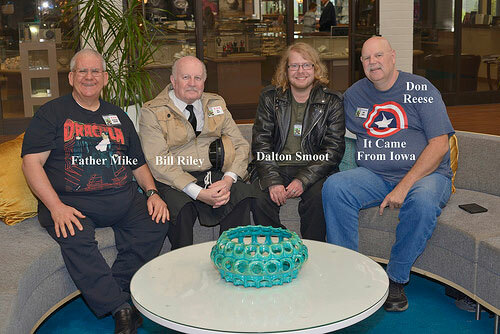 A great group lounging in the Monster Bash hotel lobby. 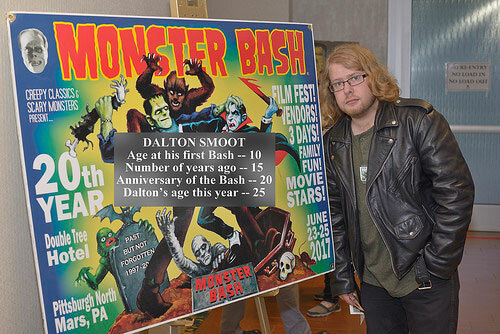 20 years for Bash, 15 years for Dalton Smoot. 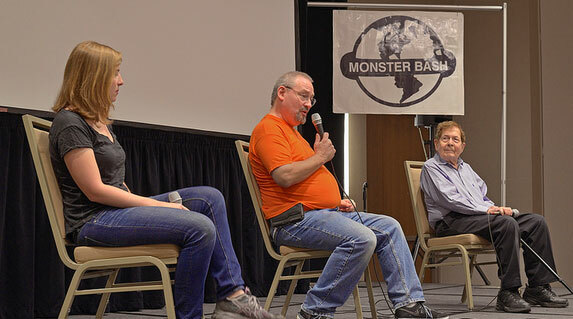 Rising from a sunken ship, The Creature at Monster Bash was courtesry of the talents of The Jerry Armellino family and Dan Weber (ship builder). 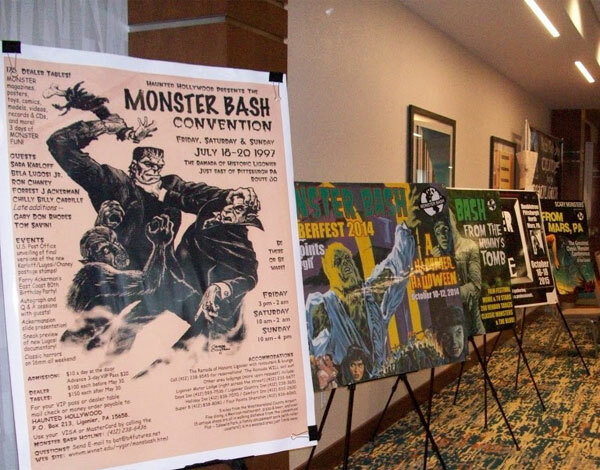 A poster of the very first MONSTER BASH flyer and poster ads for Bashes through the years down the Guest hall. 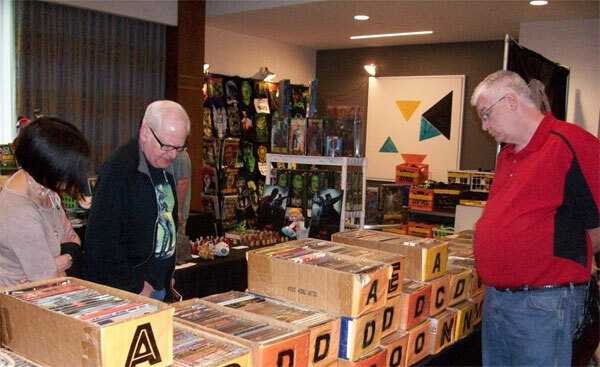 Shopper in the Creepy Classics area. 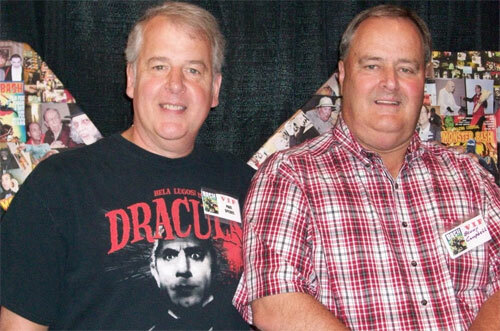 Superfan Paul Spiedel gets close and personal with actress Terry Moore! 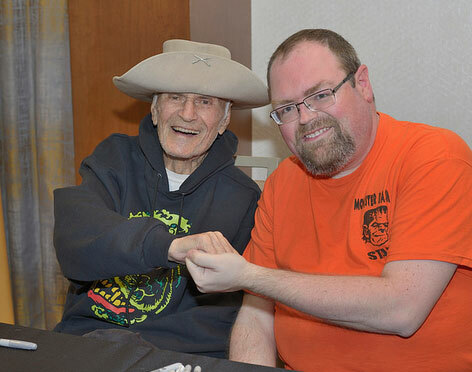 Larry Storch of F-TROOP and GHOST BUSTERS from TV fame laughs along with Paul Speidel. 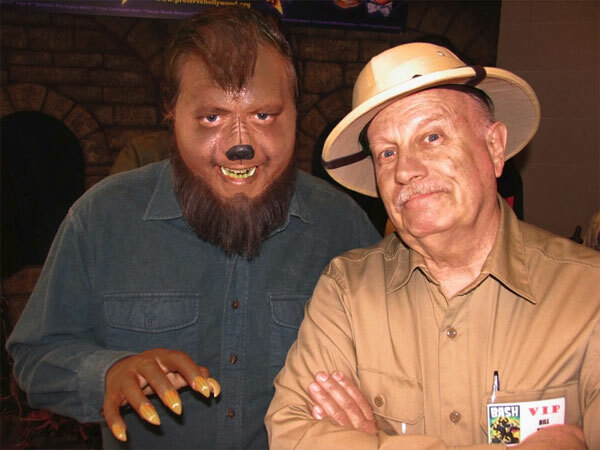 It's the Teenage Werewolf from HOW TO MAKE A MONSTER, Gary Clarke with attendee Paul Speidel. 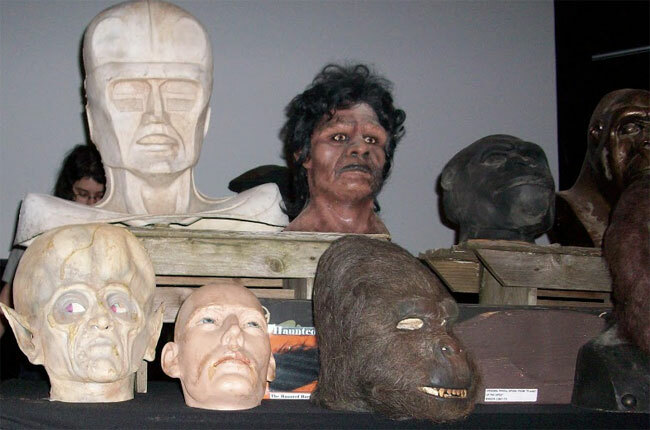 The creepy cool, life-size monsters at THE WITCH'S DUNGEON set-up at Bash! Shock till you drop....a small slice of the huge dealer ballroom at MONSTER BASH. 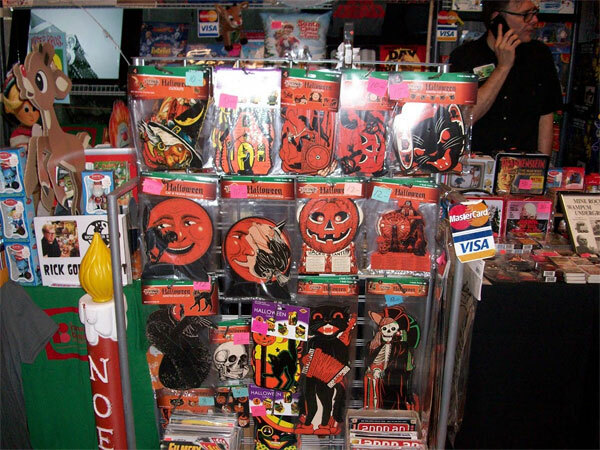 Retro Halloween goodies in the ballroom at MONSTER BASH! 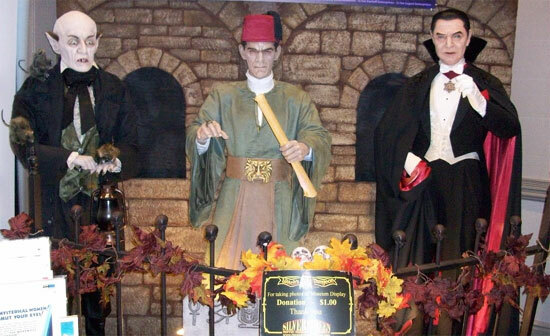 Part of the 50th Anniversary tribute to the film MAD MONSTER PARTY at MONSTER BASH. 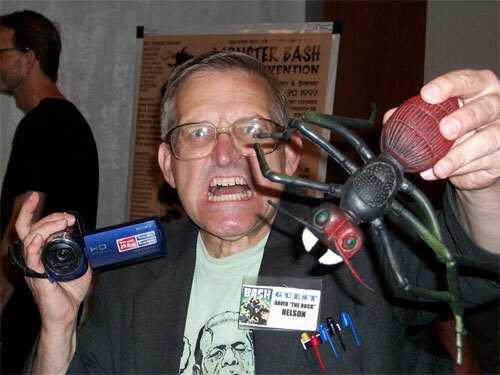 The one and only, mad movie maker, David "The Rock" Nelson and his "Devil Ant." 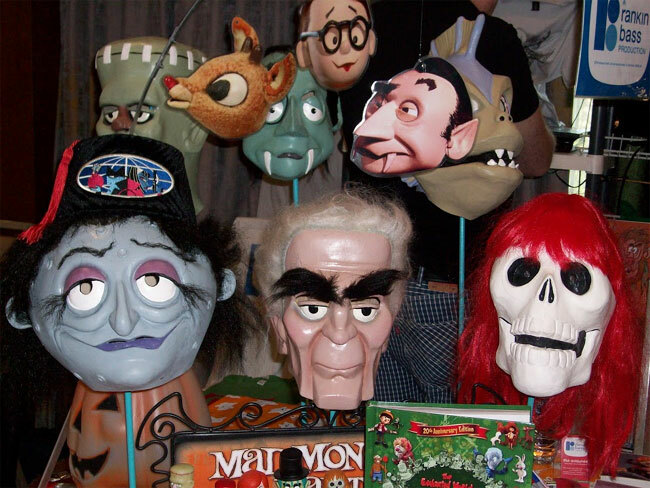 It's Monster Kid Show-And-Tell with the Joe Vento Collection. 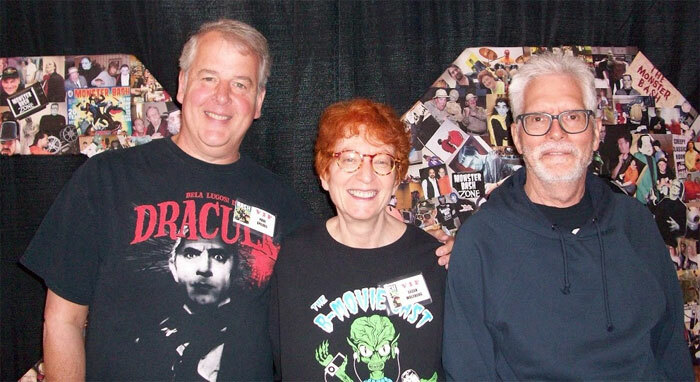 Bashin' friends: Pauil Speidel, Eileen Wolfberg and Tom Jackson stand in front of a giant "20" with a MONSTER BASH collage on it. 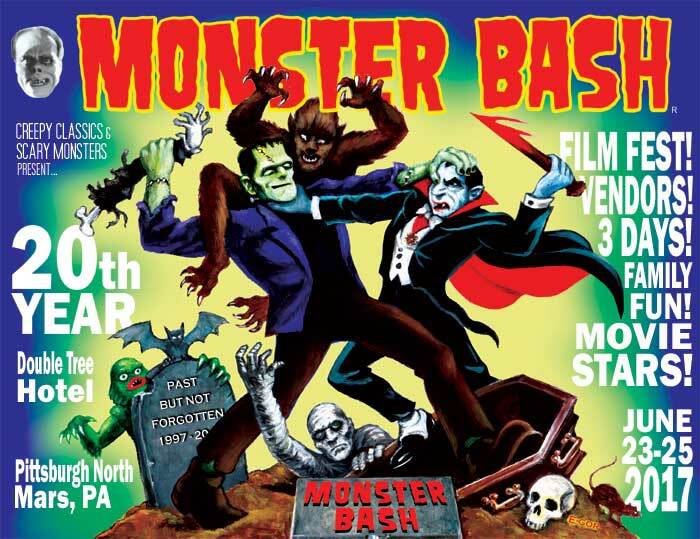 For the 20th anniversary of MONSTER BASH! 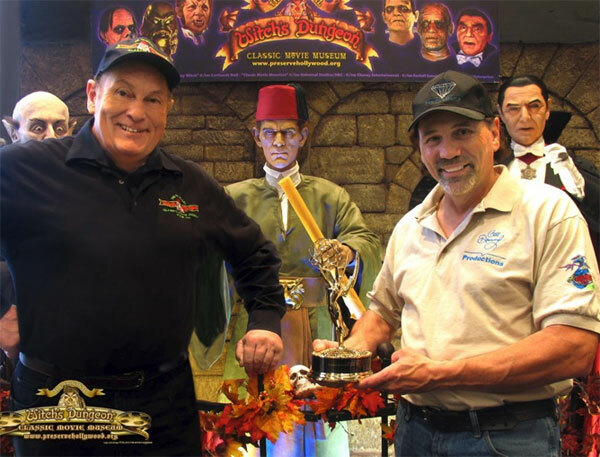 Cortlandt Hull and Bill Diamond (with his Emmy!) 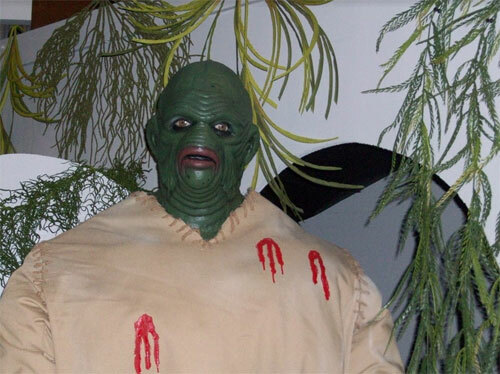 at MONSTER BASH. 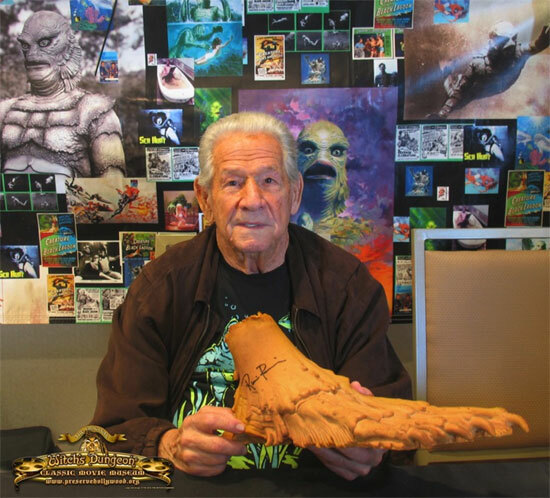 Ricou Browning holds a "Creature Foot!" 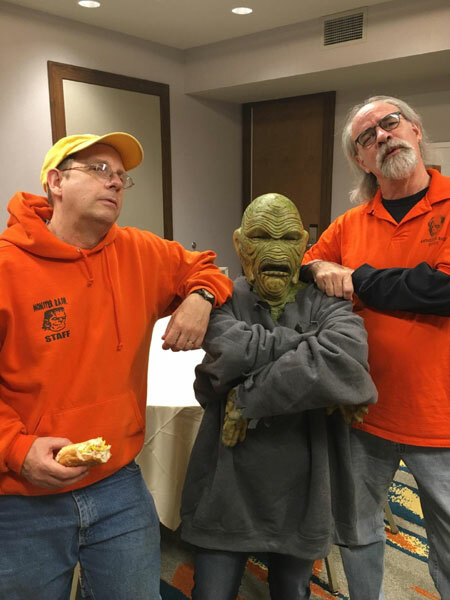 The WITCH'S DUNGEON gang: Justin Adkins, Josh Lycans and Rob Lansley at MONSTER BASH! 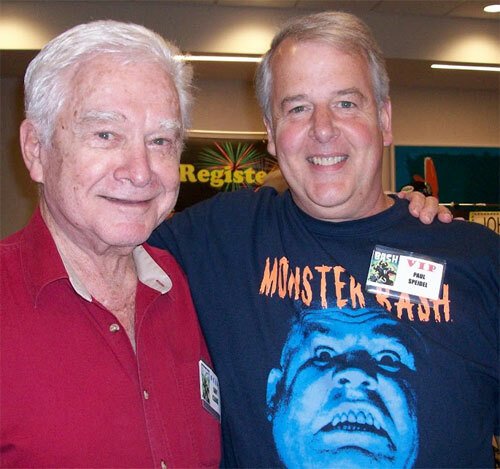 Jason Crutchley (in make-up by Josh Lycans) and Bill Reilly at MONSTER BASH. 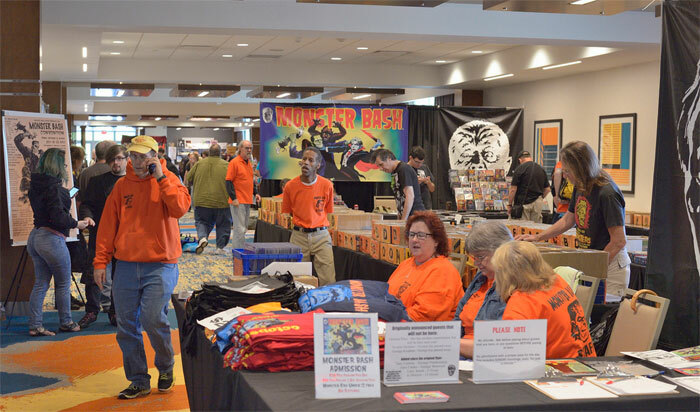 Bustling activity at MONSTER BASH registration. 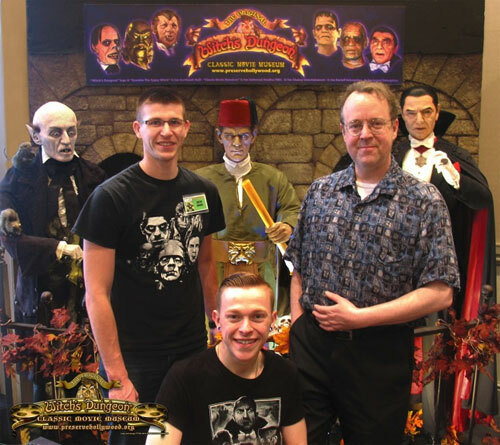 At the check out for the Creepy Classics area of MONSTER BASH: Ron Adams, Mike Doelling, Paisley Adams and Earl Lisk. 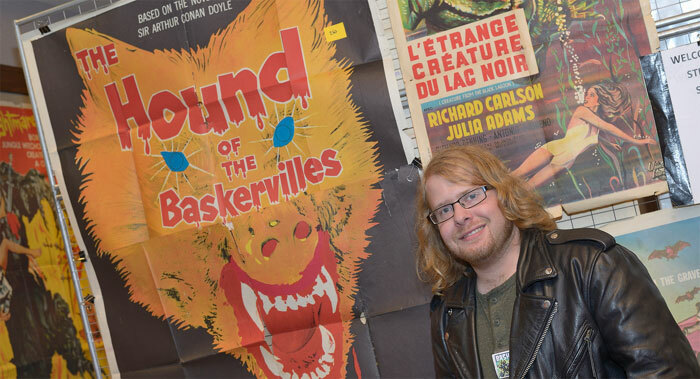 The original poster room at MONSTER BASH...the Steve Sally Collection and Dalton Smoot pictured. 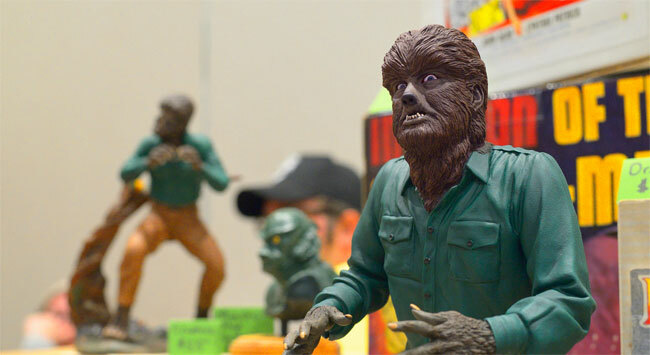 It stalks from a vendor table at MONSTER BASH! 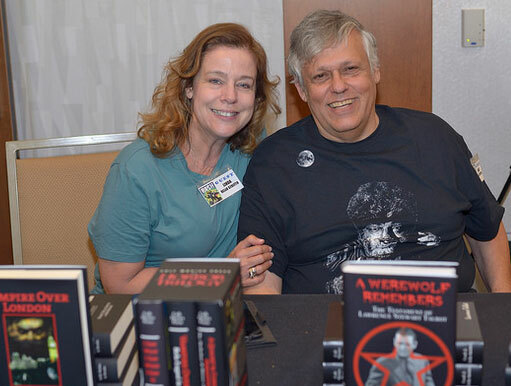 Author Frank Dello Stritto with his wife Linda...and Frank's new book "A Werewolf Remembers!" 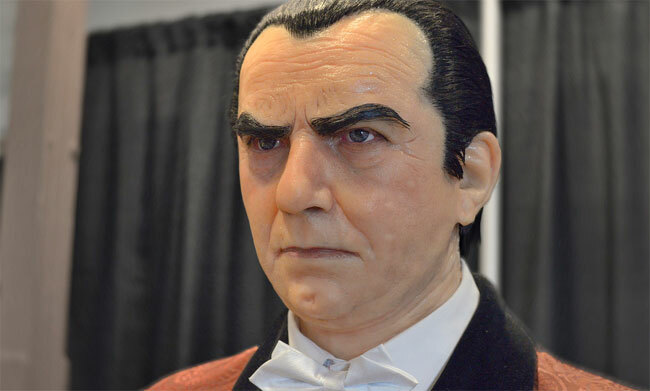 Bela Bashes...a life like figure from Tony Pitocco and Bill Luciani. The outdoor movie on the grassy area outside of the hotel. 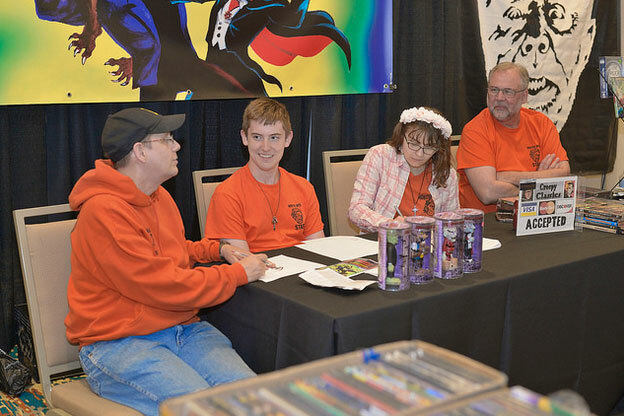 Gary Conway (Teenage Frankenstein), Gary Clarke (Teenage Weewolf) and Scott Goettel during a Question & Answer session on stage. Very funny and informative! 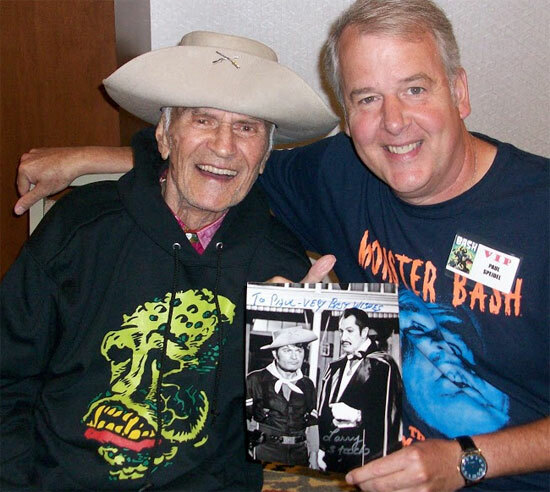 Larry Storch from F-TROOP and MONSTER BASH's Leonard Hayhurst. Christina Gordon, Bob Pellegrino and Legendary Movie Maker, Bert I. Gordon....Mr. B.I.G. 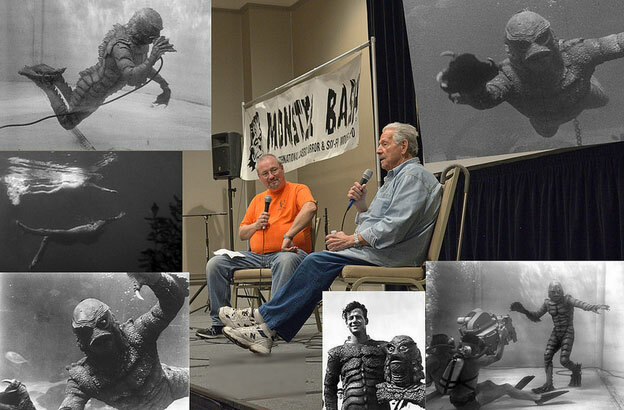 MONSTER BASH's Bob Pellegrino interviews the last living actor to play a Universal Classic Monster, Ricou Browning. 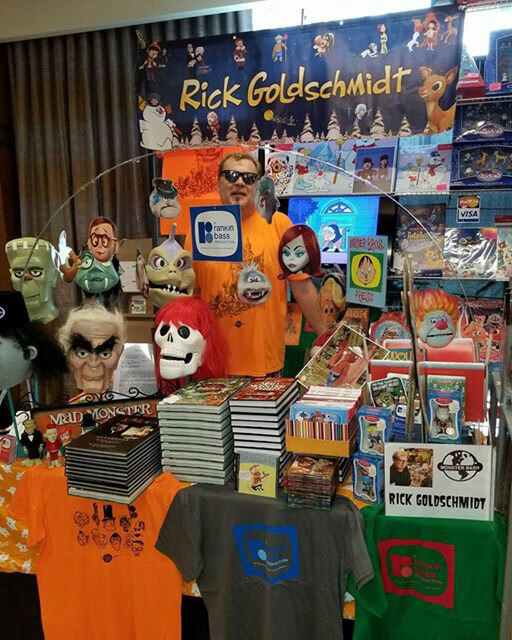 The man holding the torch for the great works of Rankin-Bass, author Rick Goldschmidt! 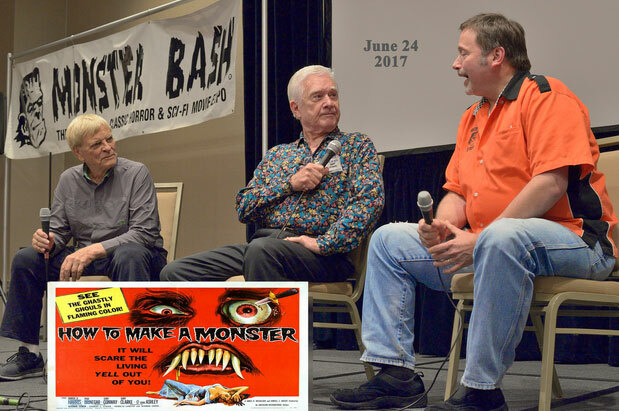 More Photos from Monster Bash 2017 - CLICK HERE!